Full-featured accounting programs like QuickBooks ( ) can seem overwhelming and complicated. 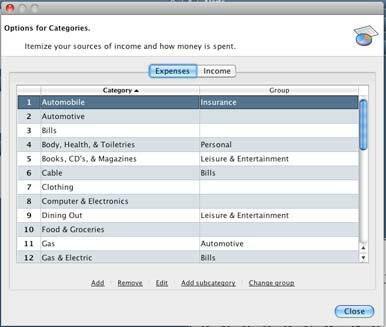 For non-CPAs with simple accounting needs, the minimalist Mini$ is an easy way to keep track of finances on your Mac. This small and simple program has a ledger for managing your checking, savings, and credit card accounts. All of the basic features needed in an accounting program are here, including the ability to itemize purchases, create custom categories, reconcile accounts, and add notes and attachments to individual items. Mini$ reads QIF, CSV, and OFX file formats, with QIF files importing the most cleanly. You can usually export your transactions in one of these formats from your bank’s Web site or from other accounting or spreadsheet software. Mini$ has a helpful budget feature for planning and tracking expenses, which can then be viewed as pie charts or exported as detailed reports. For those who are new to budgeting, this easy-to-understand breakdown of expenses can be a very useful, and sobering, feature. A colorful pie chart that breaks down the percentage of your income spent on gadgets versus the percentage spent on groceries can be an effective push to curbing unnecessary spending. To help you stick to the budgets and avoid surprises or overdrafts, you can create alerts for upcoming payment due dates and schedule repeat transactions like rent and bills. This peek into the future of your cash is also a great tool to have when making purchasing decisions. Unlike Quicken Online and many other online banking programs, Mini$ does not help you categorize your transactions. Unless categories are already identified on the imported document, you’ll have to go through and individually select the category each item falls into. Also, Mini$ doesn’t have any automatic updating capabilities. 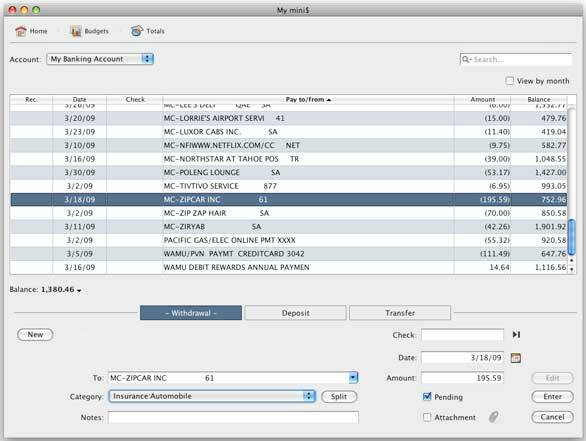 You’ll need to manually import your transactions on a regular basis, or just enter them directly into the program. Mini$ is perfect for anyone with straightforward accounting needs looking for an easy-to-understand money managing program, and it’s especially great for those who don’t feel safe with the more automated online options.